On Monday, we revealed our master bathroom updates. 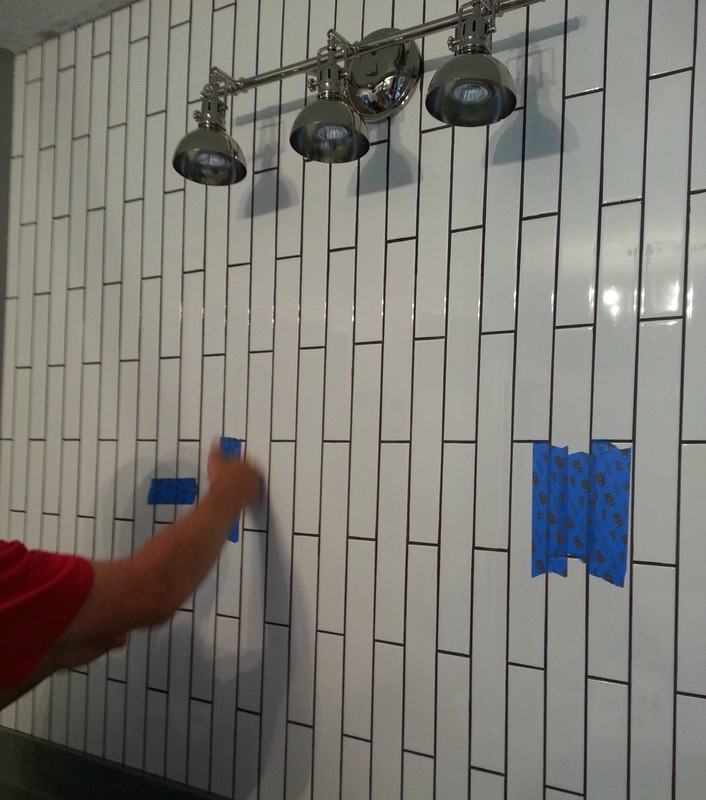 Today we'd like to share with you our tips on how to drill into tile. Well, I don't actually want to share it because it's boring and I only like sharing fun and pretty things. I guess this blog should be useful for something now and then though, right? We installed the tile onto the wall. We then needed to hang the mirrors. The only way to hang the mirrors was to drill through our precious tile. The thought of breaking/chipping/ruining our pretty new walls was terrifying. Did we really need mirrors in a bathroom? Turns out we did. We sucked it up, did some research, some drilling and then stared longingly into our beautifully hung mirrors. Choose the correct drill bit. Regular drill bits aren't strong enough to drill through tile. Tile is made to be strong and hold up to a beating but these qualities make it hard to drill into. We chose a carbide-tipped masonry drill bit. These bits are made to drill through very tough surfaces. Prep the area you are going to drill into. We used painter's tape to mark the spot where we were going to drill. The painter's tape helps mark the spot but it's also very important because it helps prevent the drill from slipping. It's hard to drill into tile because the drill bit likes to hop around on the tile instead of drilling into it. The tape gives the bit some traction. Let the drill do the work. Use light pressure on the drill. It's tempting to want to drill fast. Drilling through tile takes patience. It took about 5-10 minutes for each hole drilled. Keep the drill bit cool. The drill bit will get hot. It's important to keep it cool so it doesn't break. The easiest way to do this is to periodically dip it into water. You now have holes that are ready for hanging your mirror!